Excerpt from Wikipedia: Alice Malsenior Walker (born February 9, 1944) is an American author. 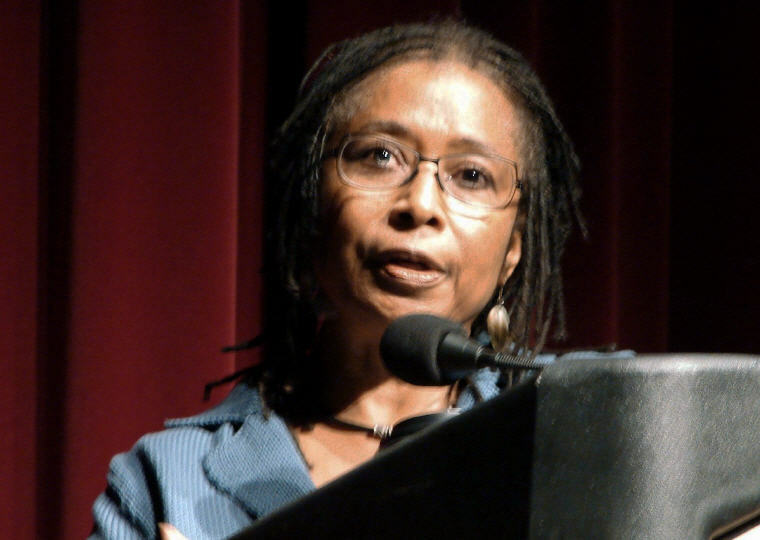 She has written at length on issues of race and gender, and is most famous for the critically acclaimed novel The Color Purple for which she won the Pulitzer Prize for Fiction. She was born and raised in Georgia. 1. But please remember, especially in these times of group-think and the right-on chorus, that no person is your friend (or kin) who demands your silence, or denies your right to grow and be perceived as fully blossomed as you were intended. #2 Quoted in The Best Liberal Quotes Ever: Why the Left is Right, 2004, William P. Martin, p. 173. 2. The most common way people give up their power is by thinking they don’t have any. 3. The animals of the world exist for their own reasons. They were not made for humans any more than black people were made for whites or women for men. 4. And I try to teach my heart not to want nothing it can’t have. 5. Nobody’s as powerful as we make them out to be. 6. The harm that you do to others is the harm that you do to yourself and you cannot think then that you can cause wars in other parts of the world and destroy people and drone them without this having a terrible impact on your own soul and your own consciousness. 7. I think unless the people are given information about what is happening to them, they will die in ignorance. And i think that’s the big sin. I mean if there is such a thing as a sin, that’s it, to destroy people and not have them have a clue about how this is happening. 8. Us sing and dance, make faces and give flower bouquets, trying to be loved. You ever notice that trees do everything to get attention we do, except walk? 9. The world is changing, I said. It is no longer a world just for boys and men. 10. Yet the gift of loneliness is sometimes a radical vision of society or one’s people that has not previously been taken into account. 1. Don’t wait around for other people to be happy for you. Any happiness you get you’ve got to make yourself. 2. In nature, nothing is perfect and everything is perfect. Trees can be contorted, bent in weird ways, and they’re still beautiful. 3. It’s so clear that you have to cherish everyone. I think that’s what I get from these older black women, that every soul is to be cherished, that every flower Is to bloom.